Home to one of the great wonders of the world: the annual majestic migration, the Serengeti hasthe highest concentration of wildlife in the world: more than 2 million wildebeest, half a millionThomson's gazelle, and a quarter of a million zebra. It takes six- eight hours to drive there. The Serengeti is roughly the size of Holland.Towards Seronera, the Park's headquarters, the landscape becomes more varied. Hills rise outof plains criss-crossed by small rivers. Umbrella acacia trees abound contrasting with the twisted,damaged commiphora trees which shows that you are in elephant country, while buffalo, zebra,giraffe and gazelles proliferate as do the famous black-maned lions and Leopards of Seronera. You may also see large herds of baboons.Near the Grumeti River, the land fades from endless vistas of savannah to swamp and riverine forestto woodland. It varies from open grass plains in the south, savannah with scattered acacia trees inthe centre, hilly, wooded grassland in the north, to extensive woodland and black clay plains to thewest. Small rivers, lakes and cactus-studded swamps are scattered throughout. In the lushswamps, there are crocodiles. There are many swamp pools lined by ubiquitous palm trees withhuge fronds and upright candelabra trees. Out of the vast sea of grass also rise great graniteoutcrops, known as 'kopjes', which have their own range of vegetation and wildlife.All wrought by volcanic activity, wind, sun, bushfire and rain.All told, there are more than 30 species of large harbivores and nearly 500 species of birds.For a fulller bird list, please see here- Birdlife of the Serengeti. It is possible to fly to the Serengeti from Arusha. It's also possible to fly over the Serengeti by balloon. Please contact us for more details. One thing is certain- the Serengeti will touch your soul. 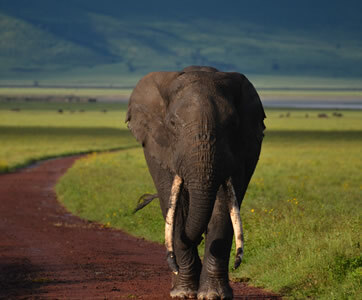 180 km (112 miles) west of Arusha lies the World Heritage site, Ngorongoro Crater. The whole area of Ngorongoro is roughly the size of Crete. Two or three million years ago, the crater formed when a large volcano around 4500- 6000 feet high exploded. Estimates of the original volcano's height range from fifteen to nineteen thousand feet (4500 to 5800 metres) high. In 1892, Dr. Oscar Baumann was one of a 200-member “Maasai Expedition”. He performed map-making duties, and was the first European to visit Lake Eyasi and Lake Manyara. During this trek, he came upon the largest caldera in the world. He officially became the first European to discover Ngorongoro Crater. Before WW1, two German brothers farmed in the crater and later threw hunting parties for their friends. Now it is 2000 feet deep and its floor covers about 100 square miles. It hosts around 25,000 animals, most of which cannot escape due to the steep inclines- largely ungulates, along with reputedly the highest density of mammalian predators in Africa, living in the crater. Large animals in the crater include the black rhinoceros and the hippopotamus; among them roam wildebeest, zebra, eland, and Grant's and Thompson's gazelles. The crater also has the densest known population of lions. On the crater rim are leopards, elephants, mountain reedbuck, and buffalo. No humans are permitted to stay in this mini Jurassic Park-like, natural animal enclosure. For birdwatchers, see the Ngorongoro birdlist. Tarangire National Park is the only source of water for wild animals during dry seasons. Famed for its huge number of elephants, baobab trees and tree climbing African pythons, it lies a little distance to the south east of Lake Manyara, 75 miles southwest of Arusha. It covers an area of approximately 2,850 square kilometers. 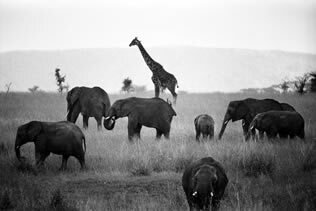 Studded with baobab trees, Tarangire National Park has some of the highest population density of elephants anywhere in Tanzania, See up to 300 elephants and wildebeest, zebra, buffalo, impala, gazelle, hartebeest and eland populate the lagoons. Tarangire hosts the greatest concentration of wildlife outside the Serengeti. View up to 550 bird varieties, the most breeding species in one habitat anywhere in the world. Marvel at the Kori bustard, the heaviest flying bird; and the stocking-thighed ostrich, the world's largest bird. A classic dry-season destination, it is possible to go on walking safaris and night game drives also.